Saskatoon Chiropractors Who Get Results! Saskatoon chiropractors, Dr. Dan and Dr. Russell have been in practice since 2000 focusing on whole family care, from newborns to great-grandparents. With a reputation for excellence in advanced chiropractic programs, acupuncture, custom orthotics, physical therapy and massage therapy, you are in good hands with Dr. Dan, Dr. Russell or Dr. McMenamin. Our chiropractors use gentle techniques that are designed to get you out of pain quickly, optimize function and reveal your true health potential. Not everyone responds the same to chiropractic treatment, so we’ll only provide you with the style and manner of chiropractic care that safely gets the job done in the shortest amount of time. Meet our chiropractors today! Dr. Russell giving a gentle Chiropractic treatment to a child. It would make no sense at all to have a treatment that hurts more than the original cause! Our adjustments are very gentle, and custom-designed for each patient. Age, physical condition, weight, body type and overall sensitivity are always taken into account, and modifications are made based on this information to minimize discomfort. We believe in thorough patient education so you’ll know exactly what to expect during your treatment. Movement Chiropractic offers direct billing for chiropractic services through most health insurance providers. Visit our Rates page for complete pricing information. Our clinic is open Saturday, as well as weekdays. 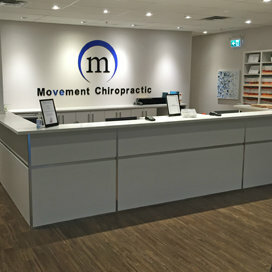 Contact Movement Chiropractic to book a convenient chiropractor appointment in Saskatoon today. Find out why our goal-oriented chiropractors get rave reviews! Contact us today for a convenient appointment.